SEPTEMBER 30, 2014 -- The risk of an oil spill in the Alaskan Arctic looms large. This far-off region's rapid changes and growing ship traffic, oil and gas development, and industrial activity are upping those chances for an accident. When Shell's Arctic drilling rig Kulluk grounded on a remote island in the Gulf of Alaska in stormy seas in December 2012, the United States received a glimpse of what an Arctic oil spill response might entail. While no fuel spilled, the Kulluk highlighted the need to have a science plan ready in case we needed to study the environmental impacts of an oil spill in the even more remote Arctic waters to the north. Fortunately, that was exactly what we were working on. Soon, the NOAA Office of Response and Restoration's Assessment and Restoration Division will be releasing a series of sampling guidelines for collecting high-priority, time-sensitive, ephemeral data in the Arctic to support Natural Resource Damage Assessment (NRDA) and other oil spill science. These guidelines improve our readiness to respond to an oil spill in the Alaskan Arctic. They help ensure we collect the appropriate data, especially immediately during or after a spill, to support a damage assessment and help the coastal environment bounce back. Why Is the Arctic a Special Case? NOAA's Office of Response and Restoration is planning for an oil spill response in the unique, remote, and often challenging Arctic environment. Part of responding to an oil spill is carrying out Natural Resource Damage Assessment. During this legal process, state and federal agencies assess injuries to natural and cultural resources and the services they provide. They then implement restoration to help return those resources to what they were before the oil spill. The first step in the process often includes collecting time-sensitive ephemeral data to document exposure to oil and effects of those exposures. Ephemeral data are types of information that change rapidly over time and may be lost if not collected immediately, such as the concentration of oil chemicals in water or the presence of fish larvae in an area. It will be especially challenging to collect this kind of data in the Alaskan Arctic because of significant scientific and logistical challenges. The inaccessibility of remote sites in roadless areas, limited resources and infrastructure, extreme weather, and dangerous wildlife make it very difficult to safely deploy a field team to collect information. However, the uniqueness of the fish, wildlife, and habitats in the Arctic and the lack of baseline data for many of them mean collecting pre- and post-impact ephemeral data is even more important and makes advance planning essential. What Do We Need and How Do We Get It? The first step in developing these guidelines, led by the Office of Response and Restoration's Dr. Sarah Allan, was to identify the highest priority ephemeral data needs for damage assessment in the Arctic. We accomplished this by developing a conceptual model of oil exposure and injury, conducting meetings with communities in the Alaskan Arctic, and consulting with NRDA practitioners and Artic experts. Our guidelines do not cover marine mammals and birds because the NOAA National Marine Fisheries Service and U.S. Fish and Wildlife Service already have developed such guidelines. 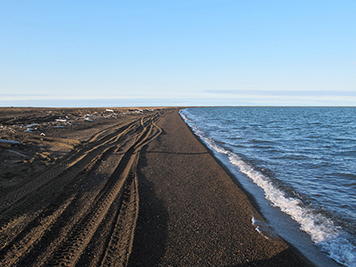 Instead, our guidelines are focused on nearshore habitats and natural resources, which in the Arctic include sand, gravel, rock, and tundra shorelines and estuarine lagoons. These environments are at risk of being affected by onshore and nearshore oil spills and offshore spills when oil drifts toward the coast. Though Arctic lagoons and coastlines are covered with ice most of the year, they are important habitat for a wide range of organisms, many of which are important subsistence foods for local communities. Once we defined our high-priority ephemeral data needs, we developed the data collection guidelines based on guidance documents for other regions, published sampling methods, lessons learned from other spills, and shared traditional knowledge. Draft versions of the guidelines were reviewed by NRDA practitioners and Arctic resource experts, including people from federal and state agencies, Alaskan communities, academia, nonprofit organizations, consulting companies, and industry groups. With their significant and valuable input, we developed 17 guidelines for collecting data from plankton, fish, environmental media (e.g., oil, water, snow, sediments, tissues), and nearshore habitats and the living things associated with them. What's in One of These Guidelines? Our Arctic ephemeral data collection guidelines cover a lot, from a sampling equipment list and considerations to address before heading out, to field data sheets and detailed sampling strategies and methods. 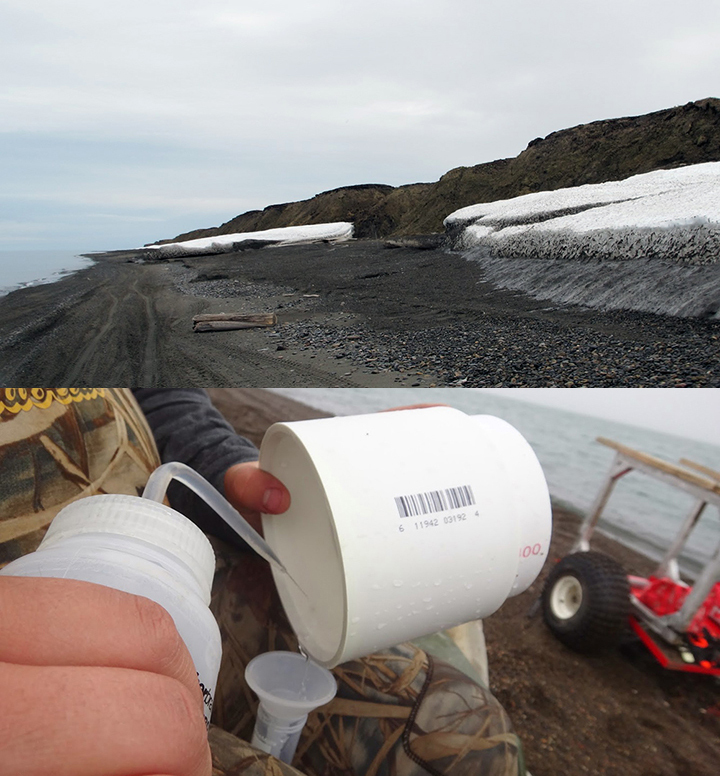 In addition, we developed a document with alternative sampling equipment and methods to address what to do if certain required equipment, facilities, or conditions—such as preservatives for tissue samples—are not available in remote Alaskan Arctic locations. These guidelines are focused, concise, detailed, Arctic-specific, and adaptable. They are intended to be used by NRDA personnel as well as other scientists doing baseline data collection or collecting samples for damage assessment and oil spill science, and may also be used by emergency responders. Though we often talk about the Arctic's weather, wildlife, access, and logistical issues, it is always humbling and instructive to actually work in those conditions. This is why field validating the ephemeral data collection guidelines was an essential part of their development. We needed to make sure they were feasible and effective, improve them based on lessons learned in the field, and gauge the level of effort required to carry them out. Many of the guidelines can only be used when there is no shore-fast ice present, while others are specific to ice habitats or can be used in any season. We field tested versions of the guidelines' methods near Barrow, Alaska, in the summer of 2013 and spring and summer of 2014, adding important details and making other corrections as a result. 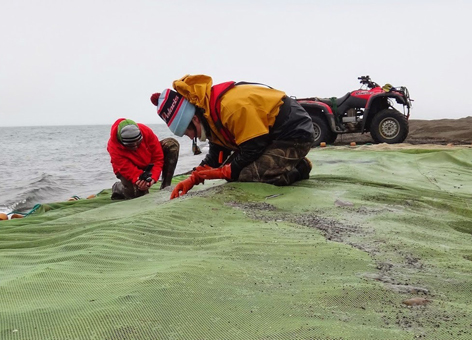 More importantly, we know in practice, not just in theory, that these methods are a reasonable and effective way to collect samples for damage assessment in the Alaskan Arctic. UPDATE: The guidelines for collecting high priority ephemeral data for oil spills in the Arctic are now available at response.restoration.noaa.gov/arctic-sampling-guidelines. Thank you to everyone who reviewed the Arctic ephemeral data collection guidelines and provided valuable input to their development. A special thanks to Kevin Boswell, Ann Robertson, Mark Barton, Sam George, and Adam Zenone for allowing Sarah Allan to join their field team in Barrow and helping her get the samples she needed.